The weather has been rather erratic lately. It is very hot and humid at one moment and a heavy thunderstorm the next. I was out to run some errands and had a dinner appointment. The sun was blazing hot and very soon, I was drenched with sweat. Just a couple of hours later, the sky became dark and then, suddenly there was a thunderstorm. This time, I was cold and drenched with rain. Feeling cold and drenched, my friend and I decided to have something hot like a hotpot or steamboat for dinner. 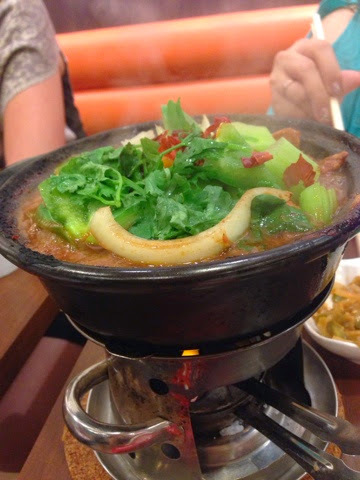 We found a hotpot restaurant - Chicken Hot Pot (鸡公煲) within Serangoon Nex Shopping Centre. This restaurant seemed to be very popular as there was a fairly long queue line formed at the entrance of the restaurant. Originated from Shanghai, China, the chicken hotpot has a unique taste and the restaurant has received many accolades and rave reviews from the media. 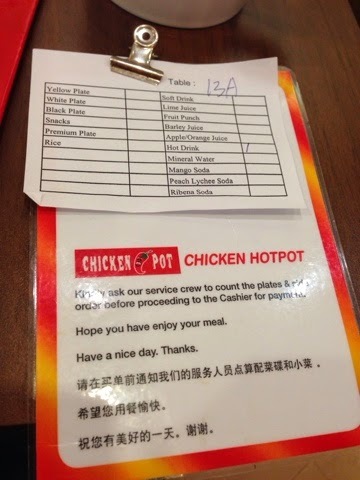 The Chicken Hot Pot at Nex Serangoon is franchised by Chicken Hot Pot Shanghai. Both of us ordered a medium-sized chicken hotpot and took three coloured plates of vegetables. Similar to Sakae Sushi dining concept, this restaurant practised coloured plates. Each coloured plate of meat or vegetables represented different prices at SGD1.80, $2.80 and $3.80. You can just pick out the dishes you like from the refrigerator and they will be counted when you go to make payment. Both of us spent SGD42.00 in total for the dinner. The three coloured plates of golden mushroom, shiitake mushrooms and kailan. The portion of the medium-sized chicken hotpot was just nice for two gals. The hotpot, when served, tasted exactly like the Kung Po chicken. We were puzzled how thIs sauce would be a hotpot. 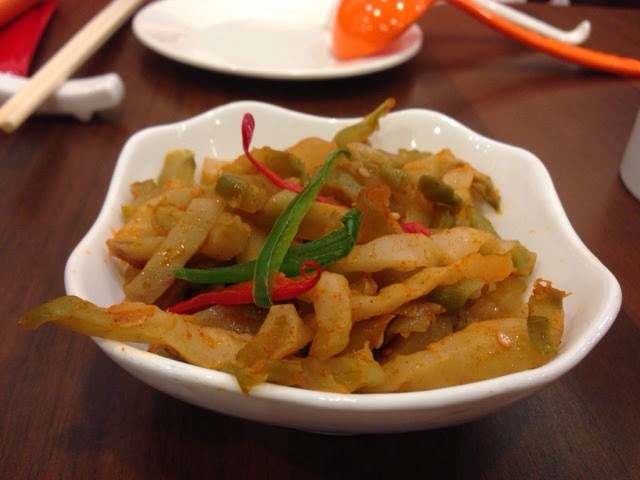 There were three levels of spiciness and we requested for the soup to be mildly spicy. In the pot, there were pieces of chicken meat chunks topped with celery. 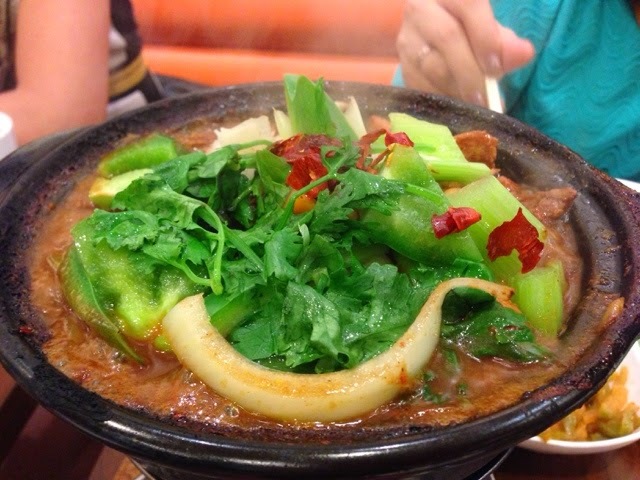 It was the first time we have eaten this type of hot pot. Usually, we have tom yam based or clear chicken broth. Instead, it was a thick brown sauce that tasted like Kung Po Chicken. Surprisingly, the sauce was delicious and tasted very nice with the steamed white rice. As the soup simmered, the server added clear chicken broth into the hot pot. It was full again. We added the vegetables into the hot pot. 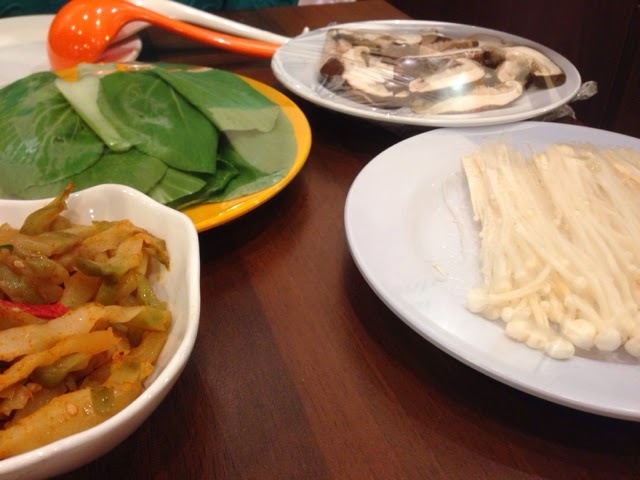 The vegetables were freshly prepared and I could taste the sweetness of the mushrooms. By the time we are done with the hot pot, we were too full. 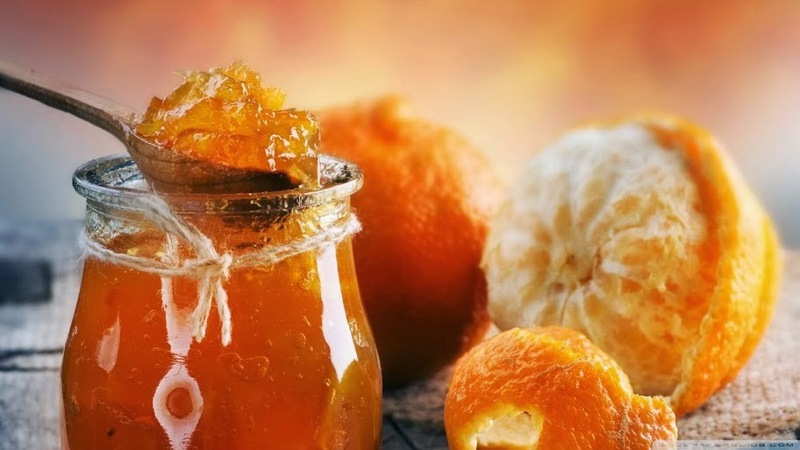 Normally, the broth of the steam boat or hot pot would taste less fragrant especially after cooking with all kinds of food. The broth in the chicken hot pot tasted even more delicious than the first time we tried the sauce. Atmosphere An open concept restaurant with self-service fridge where you pick your own ingredients. Sound An open restaurant that it is straining to converse with someone next to you.